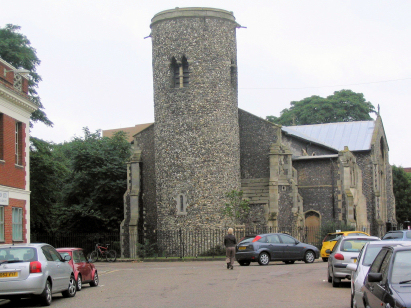 The parish of St Mary Coslany lies in the northern part of the city of Norwich, in the area known colloquially as "Norwich-over-the-water" (North of the Wensum River). Coslany was one of the founding Saxon areas of the city, slightly higher than the river but close to the ancient fording point that is marked by the present day Oak Street. At the time of this transcript this was one of the most overcrowded and fetid areas of the city, a maze of yards and courts off the principal roads housed a population which had been almost dependent upon the weaving and ancillary trades, they were suffering from the decline of that trade badly. Even through until the late 20th century this was an industrial area but nowadays it has lost that focus becoming once more a residential area. St Mary Coslany church sits at the junction of St Mary's Plain and Oak Street, it is no longer used for worship being one of the many redundant churches in the city - it is now used an arts and crafts centre. 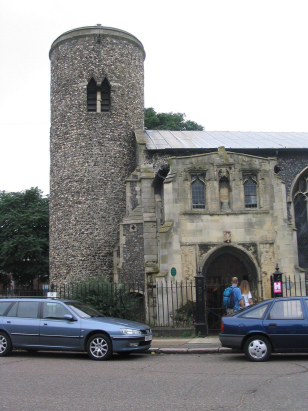 The round tower marks the church as one of the original Anglo-Saxon churches of the city, it is probably the oldest surviving church building in the city. The present day structure owes much to an extensive early 20th century restoration which took the building from near dereliction to its present state. That restoration is not the only one the building has needed, the history shows major works in both Decorated and Perpendicular styles which have updated the building over the centuries. Two standard register books cover the period of the transcript. The first a 1600-entry register covers to 1853 whilst the second, an 800-entry register covers the remainder through to the mid-20th century. The first register is filmed on Microfilm MFRO322B, the second on MFRO357 in the collection of the Norfolk Record Office which were used to prepare this transcript. Both films are recent re-filming to replace the extremely elderly fiche which had been available prior to that. The film quality for both is good and it needs to be, one would expect a sophisticated city parish to keep immaculate records but sadly this was not the case here. In places the register is, quite frankly, a scruffy mess. Poor handwriting, missing details, inserted entries, out-of-date sequence events and general scruffiness abound making for a rather challenging transcript to prepare. Whilst every care has been taken, including referencing the on-line image copies on Familysearch complete accuracy cannot be guaranteed on this occasion.